Is a Prius Extended Warranty or Protection Plan Worth It? Home/Extended Vehicle Warranties/Prius Extended Warranty or Vehicle Protection Plan – Is it Worth it? Toyotas are reliable vehicles, right? 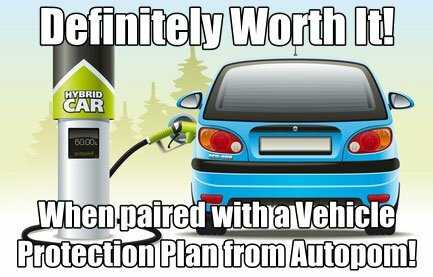 So is a Prius extended warranty (purchased at the dealership) or vehicle protection plan from autopom! really worth it? Many people argue that with Toyota’s reputation for dependability, extended coverage is a waste of money. But, as with anything in life, that really depends on how big of risk you are willing to take. I suppose if you have some mechanical skills and a well-padded emergency fund then it’s worth the gamble. On the other hand, if the idea of car repairs, unexpected breakdowns, and inconvenient interruptions to your carefully planned schedule is less than appealing, then a Prius extended warranty or vehicle protection plan is worth the minimal monthly expense, no matter how reliable the vehicle may be. Hybrids may be the way of the future; but although they have been around for several years, they still haven’t found much success on the used car market. Many dealers say that customers shy away from them unless there is a warranty attached because they are afraid of the high repair costs that come with electrical and computer failures. While Prius has enjoyed high-reliability ratings, they are still complex cars with unique technology. Yes, they offer a lot of advantages but, as with any vehicle, owners must also be prepared for the disadvantages. After all, no vehicle is perfect. Great Reliability. Prius receives the highest marks for reliability, which can be expected – it is a Toyota after all. Although each model year introduces new advancements, Toyota was a pioneer in the hybrid market and the technology has proven itself over the years. Great Fuel Economy. If saving money on fuel is a priority then you won’t be disappointed with the Prius. Depending on the type of driving you do, it is not unusual to go a month between fill-ups. And, since the car automatically switches between electric and gas power, you will notice the fuel savings even on longer trips. Eco-Friendly. If you want to reduce your carbon footprint and drive a car that is environmentally conscious, then it doesn’t get much better than the Prius. With clean electrical power and very low gas emissions, you will be saving money and doing your part to protect the planet. Low Cost Of Ownership. Although the Prius is full of complex computerized technology, it has less mechanical parts than non-hybrid vehicles. This means that you won’t be spending money to replace such things as alternators and starters. And, because the brakes are rarely used, they can last for years. Owners also report that the cost of regular, preventative maintenance is low, making it a very affordable car to own. However, it should be noted though that when things aren’t used, they tend to break down, and a common complaint among Prius owners is seized or corroded brakes due to lack of use. So, many mechanics suggest using the brakes once in a while to keep them in good working order. Very Quiet. Since there is no engine noise, the Prius can be virtually silent. It does take some getting used to, and I kept thinking that the car had stalled. If I could have figured out which glowing 3-D hologram to touch, I would have turned on the radio just to have some noise. Comfortable and Roomy. Some very tall people have complained about lack of leg and head room, but that is typical of any small/mid-size sedan. The newer models seem to be much better, and the trunks are remarkably large. Costly Repairs. While the Prius may not break down very often, it is a complex car and replacement parts can be expensive. The battery alone can be over $3000. And, not every mechanic is comfortable or qualified to work on hybrid vehicles (even if it is a non-hybrid related repair) so you may have to take it to a specialized shop, which will likely charge you higher fees for their “in-demand” services. Post Warranty Issues. Many Prius owners report its amazing reliability until the manufacturer warranty expires, and then it seems like a multitude of problems appear, such as issues with the catalytic converter or electrical systems. This is not unique to Prius since vehicles are more prone to breakdowns as they age; however, with the higher repair costs associated with intricate computerized systems, post-warranty issues can be a definite downside of owning a hybrid. High Depreciation. The Prius has a higher than average depreciation. Many experts blame this on the uncertainty of hybrid technology, especially when the warranty has expired. Lack Of Power. Prius owners say that the car has a lot of pep when compared to other hybrids, but it is not the most exciting vehicle to drive. If you are looking for an economical, environmentally conscious car then the lack of power is probably a non-issue, but I don’t think you will be seeing Prius join the Nascar circuit any time soon. Learning Curve. From its push-button starts to its touchscreen computers and regenerative braking, learning to drive a Prius definitely requires a bit of a learning curve. You are not going to climb behind the wheel and drive it like any other car. Is Prius Extended Warranty Right for You? While there are many advantages that make the Prius an appealing car to own, are the disadvantages sufficient reasons to support purchasing an extended warranty or vehicle protection plan? I would say yes. There is no point in saving fuel or saving the planet if you are sacrificing your peace of mind worrying about computer failure that could cost you a fortune. Just the diagnostics alone could be outrageously expensive. Toyota sells extended warranties specifically for the Prius, but an autopom! vehicle protection plan or Prius extended warranty can give you comparable, or even better coverage at a lower price than most plans offered at dealerships.